"There may be 'sin' in the name, but there's goodness in every scoop. 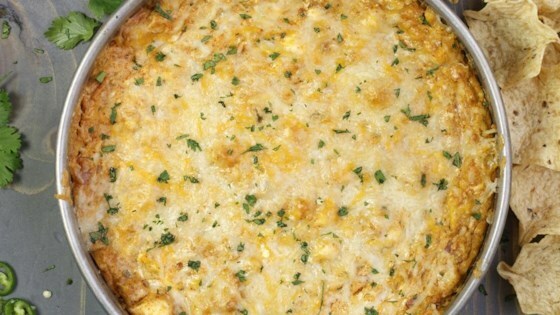 This gooey, cheesy, ham-filled dip gets a spicy kick from diced green chiles and McCormick® Taco Seasoning Mix. Serve with tortilla chips and bask in winning the appetizer game." Preheat oven to 350 degrees F. Mix cream cheese, sour cream, chiles, Seasoning Mix and 1/2 cup of the shredded cheese in large bowl until well blended. Stir in ham. Spread in 9-inch pie plate sprayed with no stick cooking spray. Sprinkle with remaining 1/2 cup cheese. Bake 25 minutes or until heated through. Sprinkle with cilantro. Serve with tortilla chips. Really good! I cooked it in a bread bowl and liked it so much I'm taking it to my church for our women's night! I made this for Family Dinner night. It was a big hit. I served it with Tostitos, but I think it would be really good with crackers or baguette slices too. This is a simple to make dip with a surprising twist with the addition of the ham. Was a huge hit at our party.